When the House of Representatives voted this week to reauthorize a 25-year old bill that helps fund programs for survivors of domestic and sexual abuse known as the Violence Against Women Act (VAWA), it turned into a debate over gun rights and the political influence of the National Rifle Association. Add Gun Control as an interest to stay up to date on the latest Gun Control news, video, and analysis from ABC News. One-hundred fifty-seven Republicans opposed the bill on Thursday, many objecting to a provision that restricts those convicted of domestic abuse, assault or stalking from buying or owning a firearm, saying it infringes on Second Amendment rights. Current law already prohibits spouses or former spouses convicted of abuse from purchasing a firearms, but a new amendment to the bill would close the so-called "boyfriend loophole," adding unmarried partners to the language. The NRA mounted a campaign against the act, urging lawmakers to vote against it. "The gun control lobby and anti-gun politicians are intentionally politicizing the Violence Against Women Act as a smoke screen to push their gun control agenda," NRA spokesperson Jennifer Baker told the Associated Press. Baker insisted the group opposes domestic violence and all violent crime, and told the AP the group annually spends millions to teach Americans how to safely use firearms in self-defense. Rep. Doug Collins, R- Ga., ranking member on the House Judiciary Committee, said he supports reauthorization of VAWA, but that Democrats "have sought at every turn to make this bill into a political weapon, rather than a critical resource for victims and tools to support law enforcement." "I cannot and will not support a bill that undermines and jeopardizes due process; that curtails prosecutorial discretion; that makes it more difficult for victims in rural areas to find housing; that could weaken programs for female victims; that could re-victimize abused women; and that undercuts Second Amendment rights," Collins said in a statement. Despite the NRA's efforts, the bill passed easily in the Democratic-held House. 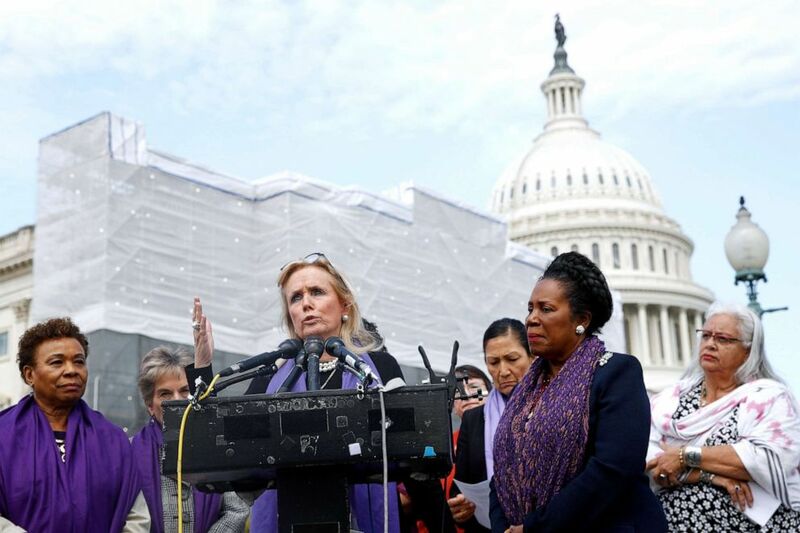 Rep. Debbie Dingell speaks as Rep. Barbara Lee and Rep. Sheila Jackson Lee, second from right, listen at a news conference after the House voted to reauthorize the Violence Against Women Act, Thursday, April 4, 2019, on Capitol Hill in Washington. "There should be nothing partisan or political about ending the scourge of domestic violence and sexual assault, which one in three women faces today," House Speaker Nancy Pelosi said in a floor speech. The bill has historically received bipartisan support since it was introduced in 1994. Moving forward, the bill faces an uncertain future. With its gun control provisions, the bill would likely be dead on arrival in the GOP-held Senate. Still, a bipartisan pair of lawmakers, Sen. Joni Ernst R.-Iowa, and Sen. Dianne Feinstein, D.-Calif., are attempting to write their own version of the bill that could have a chance of passing the Senate. Spokespeople for Ernst and Feinstein would not provide any details on how the Senate bill might differ from the bill passed in the House.